In August, Chanel Craft Tanner took the helm as director of the Center for Women at Emory, which will celebrate its 25th anniversary with a bowling party on Oct. 21. This year marks the 100th anniversary of women on Emory's campus, which began in 1917 when Eléonore Raoul was admitted to the School of Law. One important development in their modern history was the opening of the Center for Women at Emory (CWE) 25 years ago this month. CWE got its start in response to campus sexual assaults and began its work in a temporary trailer, opening in 1992. Today, the organization has grown into an advocacy and resource center on issues of special importance to women who learn, teach and work at Emory. The CWE will celebrate its 25th anniversary during this weekend's Homecoming with a gathering that is decidedly more casual than the 20th anniversary celebration in 2012, and the formal commemoration during the 100 Years of Women of Excellence Awards ceremony last spring. The Emory community is invited to a bowling party at Wisteria Lanes Bowling Alley in Emory’s Conference Center Hotel on Saturday, Oct. 21, at 4 p.m., right after the Homecoming festival and concert on McDonough Field. "We're super excited and really want it to be a fun celebration," says CWE Director Chanel Craft Tanner. "For us, it's a way to thank the students, staff and alumni who were instrumental in making CWE what it is today and for whom CWE has been a home." Along with refreshments and music from the '90s, students, alumni and parents will get what for many will be their first introduction to Tanner, who took over leadership of CWE in August after serving as assistant director. The self-described scholar-activist is a PhD candidate in Women's, Gender and Sexuality Studies at Emory. 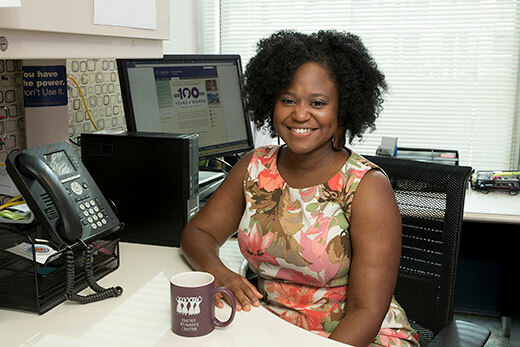 She holds a master's in women's studies from Georgia State University and a bachelor's in government and politics from the University of Maryland-College Park. Tanner recently shared her thoughts about this exciting time for CWE and what's on the horizon. How does it feel to reach this significant milestone in CWE's history? The beauty of milestones is that they give you a chance to simultaneously look back and think ahead. As we celebrate our 25th anniversary, we can't forget about CWE's beginnings as a collective struggle by students, faculty, staff and alumni to hold the university accountable to its commitment to diversity. They fought for a safe space for women to gather, explore issues of concern and advocate for gender inclusion and equity on campus. The center's focus going forward is to continue to harness this incredible spirit to meet the needs of today's Emory woman. Why has it been important to have such a supportive space for women at Emory and on other campuses? Despite the fact that women make up about half the enrollment at many of the nation's colleges and universities, they are still institutionally marginalized as a group within society and still face gender discrimination, sexual harassment and violence on campus; therefore, a safe space to explore issues of women and gender is still needed. Emory has some of the nation's most altruistic students. How has CWE contributed to that? That's definitely true of the women that frequent the Center for Women. CWE has played a tremendous role in helping students translate their passions into intersectional programs and initiatives that help make Emory a more inviting and inclusive place. The examples are numerous. Blacktivism Conference organizers held their planning meetings here. The spearheader of the Recognizing, Empowering and Affirming Latinas [REAL] Conference is a former CWE student worker. CWE is an adviser to the new group Students for Prison Education, Activism and Reform [SPEAR]. How does CWE plan to engage men who also learn and work on campus as partners for change and betterment of women? While CWE centers its work on amplifying the voices and experiences of women and gender non-conforming people, it's not a space that excludes men. In fact, we often employ students who identify as men, and men regularly frequent our space. We are, however, working more intentionally on creating a model of allyship called the Healthy Masculinities Initiative. We are partnering with the Respect Program and our community partner Men Stopping Violence to shape what this will look like. In what ways has CWE extended its reach and involvement in the support and uplift of women beyond Emory's campus? Much of what we do outside of Emory focuses on girls and supporting initiatives that allow girls to show leadership and reach their full potential. We work closely with Graduation Generation and Emory Athletics to bring in about 50 local middle school girls for our annual Girls in Sports Day. We are also a part of the Atlanta Women and Girls Collaborative, which is housed in the National Center for Civil and Human Rights. As a collaborative, we put on events for International Day of the Girl and International Women's Day as well as support each other's initiatives. As its new director, what are your early thoughts about CWE's future? I'm excited about the future of CWE. Over the last few months, we've been thinking about the kind of women we produce here. They are campus leaders who are instrumental in shaping the Emory student experience. Our student workers are often recipients and finalists for major Emory awards, winners of the top awards in their majors and creator programs that end up being institutionalized. They leave Emory as real change agents and proudly state that CWE played a major role in their development. We want to give that kind of mentorship to more women, empowering them to create the Emory they want to see. To accomplish this, we are re-examining how we do women's center work and are in the beginning stages of creating innovative hubs of students that use collective leadership models. I am also thinking critically about the impact of CWE on the overall Emory student experience, even for those who do not frequent our space or programs. What new programs or initiatives are on the horizon? I believe that digital spaces can be transformative. A part of what we'll be doing at the CWE this year is thinking about what it means to be a women's center during a time in which people are living their lives online. We are being more intentional about our digital presence. We just launched our "Ladies of Misrule" podcast, and we are working to transform our social media platforms into spaces that educate people on women's issues, enable people to advocate for women and girls, celebrate the multifaceted accomplishments of women and empower women to activate change in their communities. How can students, faculty and other stakeholders get more involved in the work of CWE? CWE is a beautiful, intergenerational space that truly reflects the diversity of age, race, class, sexuality and thought found in the larger Emory community. Dozens of people come through our doors daily just to hangout, have a cup of tea, use our lactation space, write chapters of their dissertations, study, rest and watch TV. We encourage people to stop by the third floor of Cox Hall and make yourself at home. You can also signup for our listserv to check out our program offerings, join a committee, or relax with us during Bad Feminists Fridays.